Some people have a post holiday season goal to get back in shape after too much indulgence. After reading Scott Weinberg’s “The Best Horror Movies of 2017 (So Far)“ on Thrillist, I have a pre-New Year’s goal. As I read through Mr. Weinberg’s list, I realized I’d only seen six of the 30(!) movies featured. Start a crash horror movie watching regime, of course. Thanks to Netflix I caught The Void. Now I’m only 23 movies behind instead of 30. As I go through titles I’ll put up a short review – and be better prepared to creat my own “Best of” list for posting here on Fand and Saucer and SciFi4Me/Horror4Me. The Void opens with a jolt. A bedraggled young man flees an isolated country house moments before a woman is dragged outside, murdered, then set on fire. The fleeing man (Evan Stern) runs in front of the patrol car of Daniel Carter (Aaron Poole). Carter takes the badly injured man to the closest hospital. 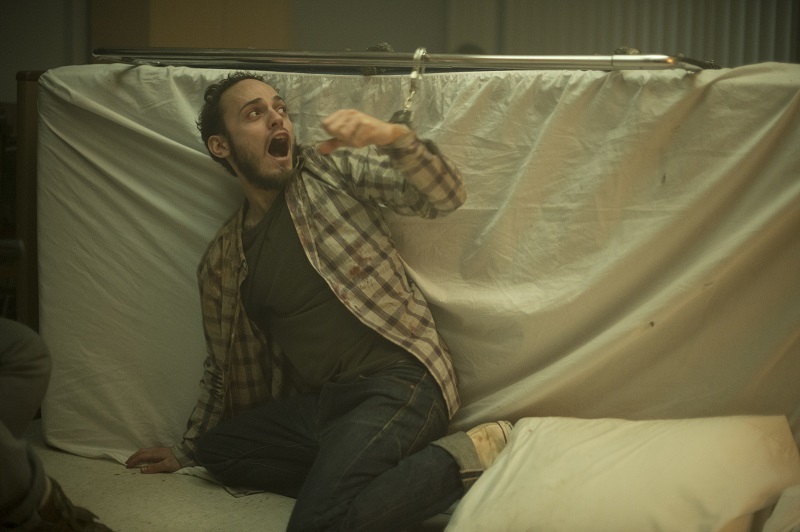 Unfortunately for Daniel Carter, his passenger, and everyone else we meet in The Void, the soon-to-be-shuttered hospital isn’t so much a House of Healing as a Portal to Hell. As a fan of creepy abandoned places, horror movies set in creepy abandoned places, and Lovecraftian Cosmic Horror, I was predisposed to like The Void. It makes the most of its setting, story, and characters to produce a movie that, for worked on all levels. It drew me in to its world, kept me watching, and left me eagerly waiting for The Void 2. Besides the skillful blending of the horror elements above, The Void takes care to adhere to storytelling logic. All of the characters have a logical reason for being at the hospital (work, illness, medical emergency). The hospital’s imminent shutdown explains both the minimum number of staff and patients and no new characters showing up once the story gets moving. Anyone who’s ever had to work the last shift in a closing store or business understands this set of circumstances and the attitudes of the employees and patients stuck in it. When your escape car is so close, yet so far away. Directing/Writing team of Jeremy Gillespie and Steven Kostanski effectively create the mundane reality of the characters and their environment. It’s easy to accept the almost imperceptible slide into unreality – the police car that suddenly seems much farther away from the hospital entrance than when we first see it, the hallucinations and visions, the sudden blurring of lines between reality and nightmare. Even the characters we only know as “The Father” (Daniel Fathers) and “The Son” (Mik Byskov) are effectively established. It’s a compliment to the entire production that every character could simply be identified in a similar way – “Old Cop”, “Young Cop” “Estranged Wife” “Pregnant Teen”, “Grandfather” and still be memorable individuals. For a soon to be closed hopital, a LOT of people are stopping by tonight. The Void’s practical effects recall the classic work of Rob Bottin (The Thing, 1982), Chris Walas and Stephan Dupui (The Fly, 1986), and Yûichi Matsui (Infection, 2004), even some of the later creature effects fall a bit short in execution compared to those three. By the time Daniel reaches the ultimate truth of what lies beneath the hospital, I was too wrapped up in the story to nitpick. The dividing line between who will enjoy this movie or not can be easily summed up. Mr. Fang and Saucer took in about 30 minutes of The Void before deciding it was time to go play Candy Crush. By comparison, when Carter witnesses a skinless mass of blood and flesh uselessly bashing their head into, and through, a metal bar in a futile effort to finally die, I felt sadness and pity. It was both a total gross-out and a heartbreaking callback to the finale of Cronenberg’s The Fly, when Brundlefly pulls a gun to his head and wordlessly begs Veronica to end his existence and his torment. The setting of The Void drew me in even as it creeped me out. Even as it transformed into a trans dimensional charnel house, I wanted to explore more of the hospital and the charnel house below it. James wishes he was back at the Farmhouse of Doom right about now. The ending of The Void, like final shot of The Beyond is both mystifyingly bleak – and oddly optimistic. We see two characters in a landscape that resembles a mix of Ancient Egypt and the Alien hellscape of LV-426. Do we know where the two surviving characters are? What they’ve become? Nope and Nope. But I have a sense that, just like Ash at the end of Army of Darkness, the next chapter of their story is just beginning. And I’d love to see it. More more goopy Lovecraftian goodness, check out The Void Official website, as well as Facebook and Twitter.